multiple resupplies must be even greater! SNOWBALL FROM OORT introduces the concept of a 7G cargo vessel launching from Sol and overtaking a previously launched 1G vessel, much slower with passengers (pax). SNOWBALL FROM OORT shows how a cargo vessel can overtake the prior pax vessel exactly one year into its cruise phase. MORE SNOWBALLS extends this profile with two variations. First, suppose that mission planners decide to up the game and send an annual resupply vessel throughout the pax vessel's cruise period. 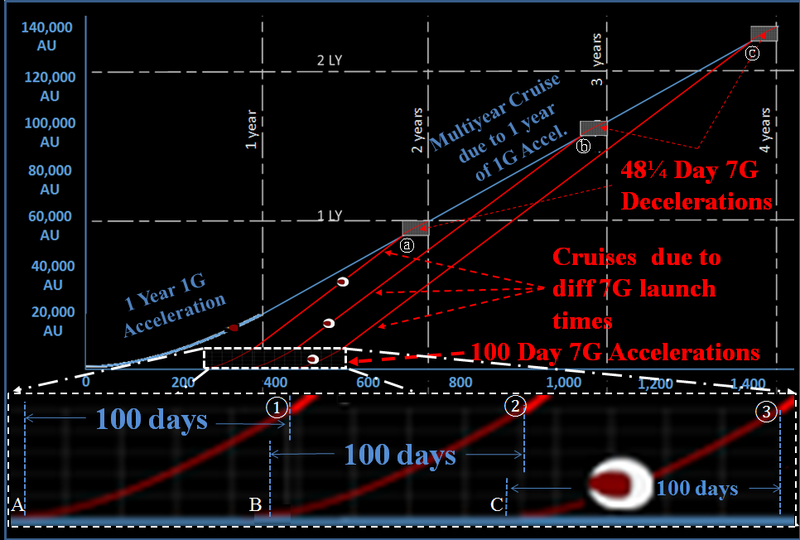 Second, consider a variable 1G vessel profile with different cruise velocities achieved by different durations of 1G acceleration (explained further below). 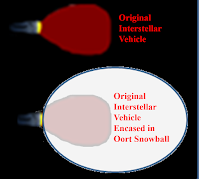 Before we "throw" the snowballs on an interstellar profile, we might want to "tow" them back to near Earth orbit for processing and additional cargo. TOWED. Economic factors will compel vessels to tow many comets back to Earth from Oort Cloud. Many missions will require routine travel between Earth and Oort Cloud (system upgrades, crew changes, etc. ), vessels may as well bring raw cargo on these "retrograde" trips. Begin trip by accelerating at g-force for 365¼ days and distance of 23,841.5 AU, to a final velocity of 64.43% light speed (.6443 c = 111.5 AU/day). Throughout the acceleration phase, occupants will feel Einstein's equivalence (unable to distinguish between 1G acceleration in space or being static on Earth's surface). After 1 year of 1G propulsion, vessel stops propulsion to maintain constant velocity of 111.5 AU/day (64.43% light speed). Artificial gravity continues from centrifugal force due to carefully controlled longitudinal spin. Earth support could launch resupply vehicles to intercept the vessel for each year of Earth observed trip duration. These "snowballs" could resupply interstellar spaceships enroute to their destination. Unmanned, they would not be limited by the need to simulate near Earth gravity; so, they could accelerate well past 1 g to quickly attain much greater velocity. They could intercept the 1G "passenger" (pax) vehicle and travel in tandem. During the remainder of the cruise period, the "snowball" could be harvested by the pax vessel occupants in a thoughtful, well planned manner. Upon approaching stellar destination, the two vessels could decelerate in tandem, and both could achieve an orbit at their new stellar home. Mission stakeholders could launch an AI controlled, unmanned, resupply flight for each Earth observed year of the Pax vessel's cruise. Such a vessel could accelerate much higher than 1G; perhaps, 7G. 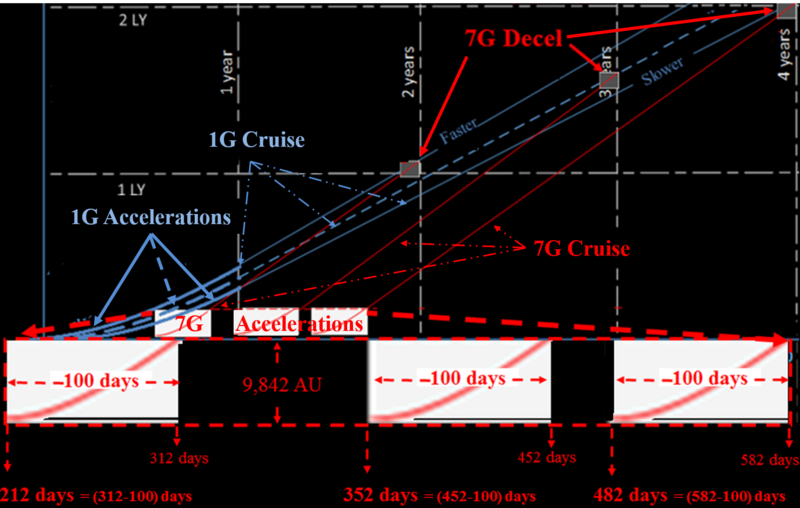 Linked table (7G Dec) uses numerical methods to determine duration and distance (48¼ days and 6,484 AUs) required to decelerate from 7G cruise speed (149.9 AU/day) to 1G cruise speed (111.8 AU/day). To determine each 7G Deceleration Start Point, simply subtract indicated values from corresponding Interception Point. 7G Cruise End Points: ⓐ 682.25 days; ⓑ 1,047.5 days; ⓒ 1,412.75 days. 7G Cruise Start Points: ① 360.2 days; ② 453.7 days; ③ 547.3 days. 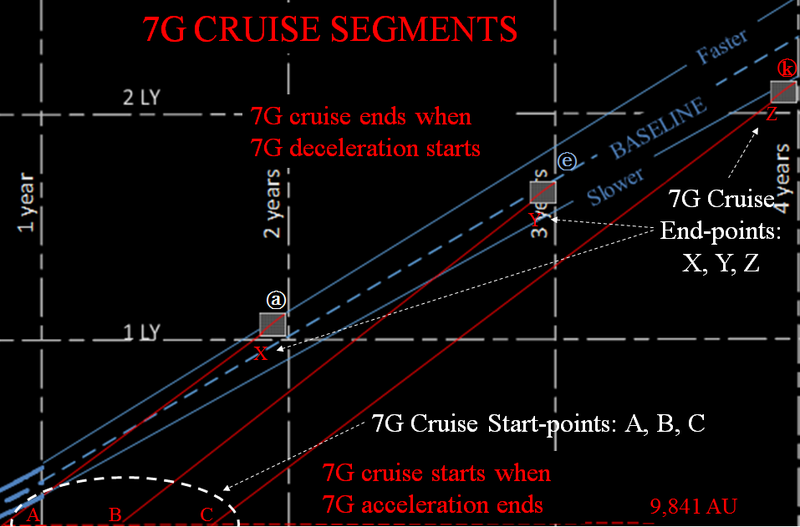 "7G Cruise End Point" coincides with the "7G Deceleration Start Point". After 100 days of 7G acceleration, Resupply vessel travels 9,802 AUs. Determine start time for each example by subtracting 100 days. Thus, first start time, A = ① -100 days = 260.2 days. Similarly, B = 353.7 days, and C = 447.3 days after Pax vessel launch. At end of each cruise phase (Points: ⓐ ⓑ ⓒ ), Resupply vessel must decelerate for 48¼ days to match speed of Pax vessel. DESIRED END STATE: Resupply (7G) vehicle matches velocity of Pax vessel exactly upon interception. For rest of flight, vessels fly in tandem. CONCLUSION: Such maneuvers can happen multiple times during the flight. by adjusting duration of 1G accelerations for Passenger vessel. Faster Cruise Speeds come from longer accelerations. 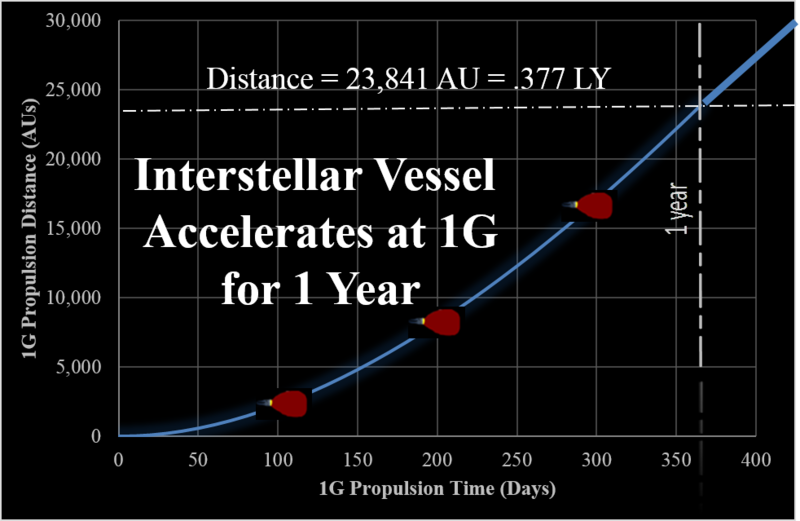 EXAMPLE: 1G propulsion for 1.1 year (401.7 days) takes vessel to a velocity of 117.9 AU/day over a distance of 28,072 AU. BASELINE: By comparison, 1G propulsion for 1.0 year takes vessel to 111.8 AU/day and 23,876 AUs. Slower Cruise Speeds come from shorter accelerations. EXAMPLE: 1G propulsion for .9 year (328.7days) takes vessel to a 105.1 AUs/day over 19,913 AUs. For convenience, arbitrarily define BASELINE 1G acceleration profile with a duration of 1 year; thus, start acceleration at day 0 and end after 365.25 days. Resultant Velocity becomes vessel's cruise velocity. See dashed line on above diagram. NOTE: To readily compare different cruise phases (following frames), arrange acceleration start times for all cruises to start at a common time at 365.25 days. 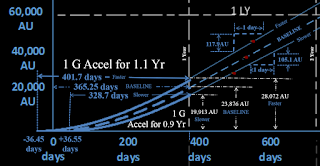 Accelerate at 1G from Sol for 0.9 years to attain reasonable cruise speed (.60c) in a distance of .31 Light Year (LY). 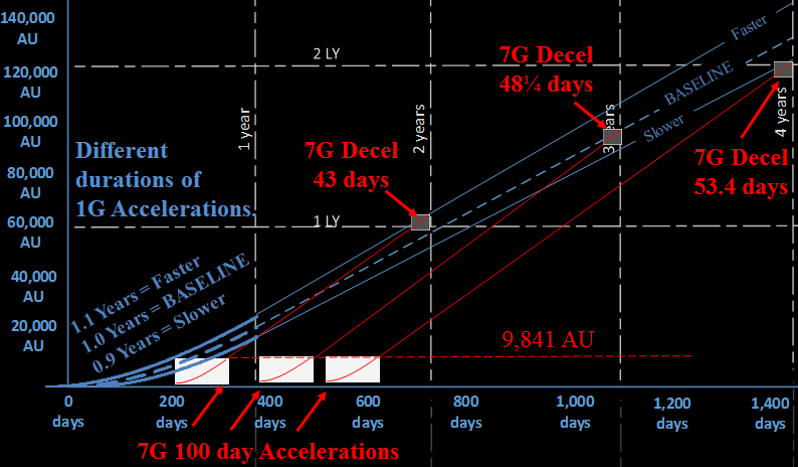 Decelerate at 1G for 0.9 year (same duration as acceleration) starting .31 LY prior to destination. 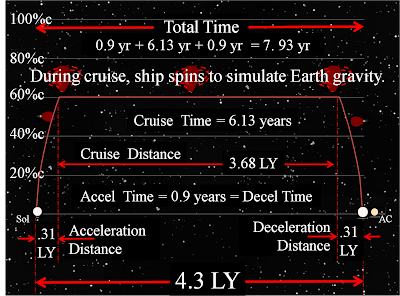 Between acceleration and deceleration, cruise for several years at constant velocity, 60% Light Speed, c.
Earth bound entity would observe cruise duration as 6.13 years (3.68 LY ÷ .60 LY/yr). 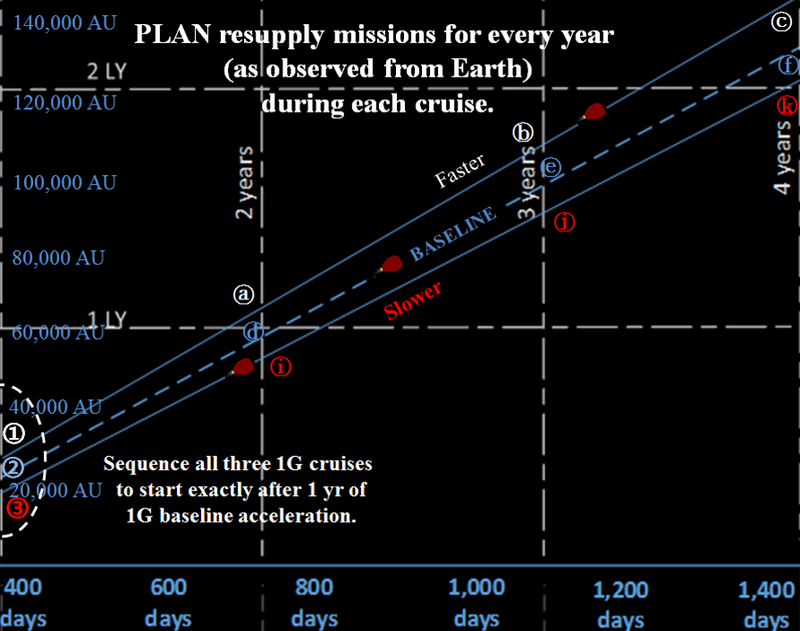 For each year (as observed from Earth) of each vessel's cruise phase, one could plan for each 1G vessel to intercept a 7G resupply vessel. To match this velocity, 7G vessel must decelerate from its cruise speed (149.9 AU/day) for 43 days and 5,843.2 AUs. 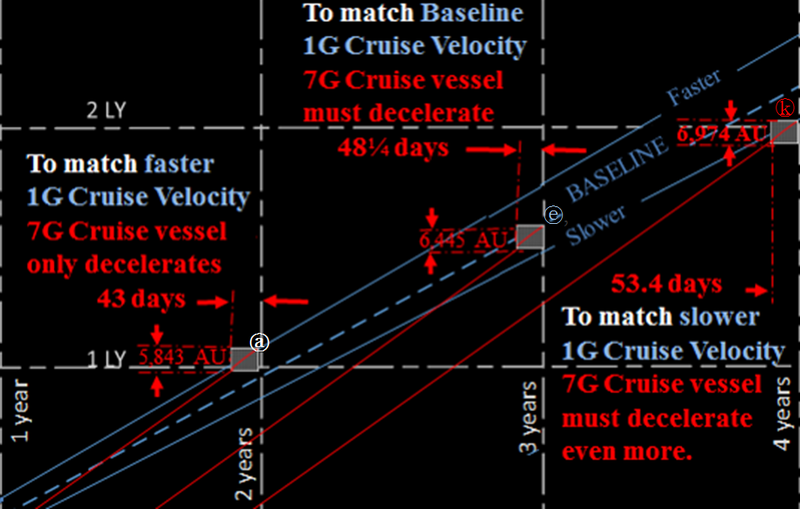 BASELINE CRUISE speed is arbitrarily chosen as vessel velocity (111.8 AU/day) attained after 1 year of 1G propulsion: Thus, 7G vessel must decelerate for 48.25 days and 6,444.9 AUs. 7G vessel must decelerate for 53.4 days and 6,974.1 AUs. Determine "start point" of 7G Decel. Assume measurements accomplished by Earth bound observers. After slight 7G deceleration interval, resupply vessel matches velocity of pax vessel at exact time/distance (Selected examples include points: ⓐ , ⓔ, ⓚ.) Thereafter, both vessels travel in tandem. coincides with start point of 7G Deceleration (Previous Table). coincides with endpoint of 7G Acceleration. "The great oak of Astronomy has been felled, and we are lost without its shadow". Jan Hendrik Oort was a Dutch astronomer; best known for Oort Cloud of comets which bears his name. Oort Cloud is the de facto boundary of our Solar System. In 1935, Dr. Oort became professor at the observatory of the University of Leiden; Ejnar Hertzsprung was the director. (Dr. Hertzsprung is well known for the Hertzsprung-Russell diagram, an essential tool in the study of stars.) Fascinated by radio waves from the universe, Dr. Oort pioneered radio astronomy with an old radar antenna confiscated from the Germans after WWII. Radio interferometry was suggested by Oort well prior to their experimental tests by others (Ryle in Cambridge and Pawsey in Sydney). In the 1950s, he raised funds for a new radio telescope in Dwingeloo, in the east part of the Netherlands, to research the center of the galaxy. 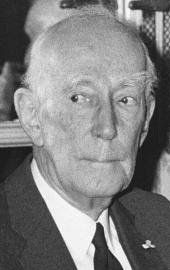 In 1950, Dr. Oort observed most comet origins to be within the Solar System. HYPOTHESIS: SOL IS SURROUNDED BY BILLIONS OF COMETS. While very few enter the inner Solar System, and even fewer are observed; an analysis of these few indicate the existence of the Oort Cloud. 1) Determine Annual Intercepts of 1G Cruises. Plan for resupply vessels to join passenger vessels at specific time/distance points. For convenience, arbitrarily choose these points at one year intervals (as measured by Earth observers). 3) Determine Start Point of 7G Cruise. Upon completion of 7G acceleration (100 days), Resupply Vessel starts the cruise portion of its journey at 149.9 AU/day. Following three examples consider 1G acceleration durations of .9 year, 1.0 year and finally 1.1 years. HYPOTHESIS: Increased durations increase fuel consumptions. In 1924, Oort discovered the galactic halo, a group of stars orbiting the Milky Way but outside the main disk. Mass of Milky Way exceeds 100 billion Solar masses. Light from Crab Nebula is produced by synchrotron emission. R7Δ = (1-7×Δ)GW = .99672 GW. 1G profile has two propulsion phases: 1) 1G acceleration to cruise speed; 2) 1G deceleration to destination. 7G profile has three propulsion phases: 1) 7G accel to cruise; 2) 7G decel to match 1G velocity; 3) finally, 7G profile's third phase is the same 1G deceleration propulsion as used in the 1G profile. CONCLUSION: More Propulsion Time Requires More Fuel. AXIOM: Most interstellar voyages require same energy for deceleration as for acceleration. CONCLUDE: 1G fuel consumed increases as propulsion time increases. to high speed cruise (149.9 AU/day). CONCLUDE: Fuel consumed still increases as 1G propulsion time increases. Jim - Congratulations on the excellence of your presentation! Your methodical approach, giving each factor due consideration, has the makings of a textbook, but the exposition would suit a wider readership as well. Your idea regarding use of a particle accelerator as a drive falls naturally out of your material, but is not the first thing a space enthusiast would consider. My own interest is in bootstrapping a space economy in the inner solar system based on use of asteroid materials and sunlight. Best regards and thanks again for the well-directed effort!